If you’ve been following our emails, you’ve seen the price changes we’ve been making in recent weeks. We are very excited about these lower prices and wanted to share with you why we’re doing this and what it means for you. It has always been the goal of Gems on Display to assist you in every way possible as you take your company to the next level. Whether that has been through jewelry displays, packaging, custom logo printing, or all of the above, our commitment to you has remained unchanged. Providing you with excellent customer service, high quality products and affordable prices is important to us. After some thought, we’ve decided that we can serve you best by re-evaluating our pricing and making reductions wherever we are able. It won’t happen all at once, but we’re going through our inventory piece by piece to see where we can make things more affordable for you. We’ll also be continuing our offer of free shipping for orders over $75 and flat rate shipping for orders under $75. * It may appear that some of our competitors have lower product costs, but you’ll find that when you add in their shipping costs, your total order cost will be higher than anticipated. We don’t think this is fair to you, which is why we’re lowering prices and keeping our shipping simple. We want your total order cost to be as affordable as possible. 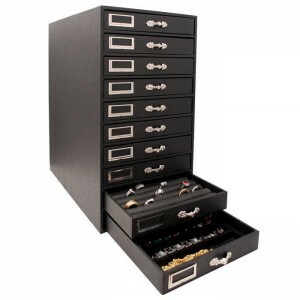 This popular jewelry storage organizer has a new, lower price! *Offers only valid in the 48 contiguous states. Step Into The Warehouse with Joey! This entry was posted in Community, Displays, Packaging, Products, Uncategorized by gemsblogadmin. Bookmark the permalink.